Thank you Father for this important bipartisan legislation. Pray for God’s heart for the Jewish people in Israel and everywhere to be reflected in U.S. foreign policy. A bipartisan bill to elevate the status of the U.S. special envoy on anti-Semitism overwhelmingly passed in the U.S. House of Representatives on Friday. Rep. Justin Amash (R-Mich.), a libertarian, was the sole vote against the legislation. The Special Envoy to Monitor and Combat Anti-Semitism Act was reintroduced last week by Rep. Chris Smith (R-N.J.). If enacted, it would upgrade the status of the special envoy to combat anti-Semitism—a position the State Department has left vacant for 20 months—to an ambassadorship requiring Senate confirmation. The president would be required to fill the position within 90 days. The special-envoy position is currently vacant and has been so since the start of the Trump administration. “Over the past decade, there has been a rapid rise in anti-Semitic acts and rhetoric in many countries: Jews harassed, assaulted and even murdered; synagogues attacked; graves and cemeteries desecrated; anti-Semitic slurs; targeting the State of Israel with the ‘three Ds’–demonization, double-standard and delegitimization–as my friend the great Soviet refusenik and religious prisoner Natan Sharansky named them,” said Smith. I am very thankful that this bill passed in the US House of Representatives and I pray that it will be passed in the US Senate. Heavenly Father lover of all Mankind, I ask that You will touch the hearts and minds of the US Senate causing them to take up this bill and pass it quickly. 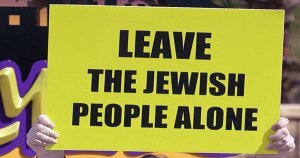 And I pray that the segment of the Jewish Community that votes liberal, their eyes will be open to who their Real Messiah is and as a result they will be set free from the condemnation that is upon them for rejecting Him as Lord & Savior. Amen! !